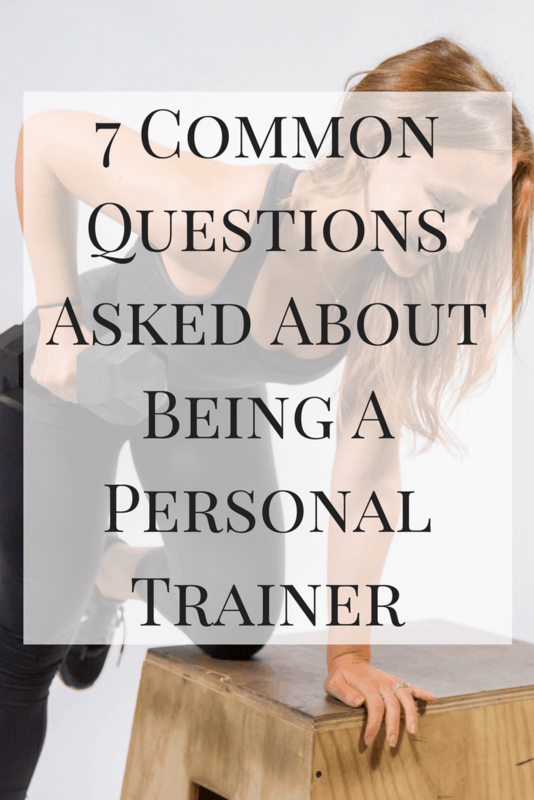 It’s been almost two and a half years since I became a personal trainer and in that time, I’ve gotten many questions about it. I wanted to address some of them here and if there are any that I’ve missed, please leave them in the comments and I can write another post! 1. How do you get clients? This is one of the questions I get the most. Building up a client base can take awhile if you’re an independent trainer, which is one of the reasons why many people start out training in larger gyms. It took me about a year to build up a solid client base. Some clients I have purely through my own referrals, but when I started, I made an account with a local site that matches trainers and clients. I was referred to clients through this service which meant that I didn’t have to aggressively market myself. If a client and I hit it off, all I do is show up and train. Someone else takes care of the money discussions and session tracking. I go home with 80% of the session price, which is still much more than working in a gym AND I don’t have to do the things that don’t excite me. The best way to acquire new clients is through word of mouth, which is why it often takes some time to build up your base. Always do the best job you can with the clients you have and you’ll likely see business increase. 2. Are there health benefits? Because I work for myself, I am responsible for my own health care benefits. I am on Neil’s insurance through his work, so thankfully I didn’t have to worry about purchasing my own plans. I’ve never worked in a large gym, so I’m not sure what the situation is (if you have, let me know in the comments!). I know that some health clubs make insurance available at a lower cost and places like NASM also offer discounts on personal insurance plans, but I’d check with any potential places of employment before making your decision. 3. Where do you train clients? I knew from the beginning that I didn’t want to work for a big chain gym. I knew that the pay for the same job was much less and it involved a lot of selling which I was uncomfrotable doing. I decided to train independently, which means that either I travel to clients or they travel to me. Luckily, there is a gym in my building that I’m able to use when clients come to me, but if you’re not in that position, check and see if there are local gyms that allow you to rent space for a small fee to train your personal clients. 4. Which certification should I get? The top two certifications in my opinion are NASM and ACE. That doesn’t mean that others aren’t credible or valid, but these are the two that I see most often. You can read my summary of prepping for and taking the NASM exam here and if you contact Jacob Houg at Jacob.Houg@nasm.org, you can get a discount off your exam package! 5. Is this your full time job? As many of you know, this is not my full time job. Because I don’t want to work weekends, that limits the days I can see clients to Monday – Friday. Most people want to work out either before or after work, which means that there is a cap on the number of clients I can see each day. I only have a few with flexible schedules that can be seen in the middle of the day, so for me it’s hard to make it a full time business. That’s not to say that it’s impossible, but for me it’s longer hours than I want to work given that I also have this blog and social media business to run. 6. How do you get experience? This is one of the things I wondered when I was getting certified. Becoming a personal trainer simply involves taking a written exam, which I didn’t feel actually prepared me for training another person. This is also why there is such a wide discrepancy in the quality of trainers out there. I found a trainer that I knew practiced independently and asked if I could shadow him. He trained a variety of people in a variety of settings and I knew it would be a great away to learn in a real environment. I made sure to ask questions when I was unclear and find out how he ran his business since I knew nothing about what i would have to track in terms of mileage, expenses, etc. Doing this helped me feel more comfortable when it came time to training my own clients. 7. Do you have to be a certified trainer to teach classes? There are both personal training certifications and group exercise instructor certifications. Certified trainers can be group instructors, but group instructors can not legally be trainers unless they also possess that certification. Each business is different, and depending on where you teach, they may require you also be certified as a trainer or you may have to complete specialized training for places with specific programming such as Pure Barre or Soul Cycle. If you’re interested in teaching classes, find out what their hiring requirements are in order to figure out what your best course of action is. Again, if you have any questions that weren’t answered here, leave them in the comments! I’ve always wondered about credentials and how you’re supposed to get experience. Shadowing a trainer is a great idea! Thanks for sharing this post. I learned a lot – some questions I’ve not even thought about before. Good info! I learned a lot. I also learned a lot about health insurance last year when it was my first year being self-employed. Obamacare offers serious discounts on health insurance depending on your income. Awesome post. Very informative and definitely answered a lot of questions for those really curious about becoming a personal trainer. It definitely takes some serious decision making if you wanna go full time, but you will reap the benefits in the long run.